Heat oven to 350°F. In 10-inch skillet, cook bacon over medium-high heat 10 to 12 minutes or until bacon is crisp; remove from pan to paper towels, and crumble. Remove all but 1 tablespoon bacon drippings from skillet. Add onion to skillet; cook and stir about 2 minutes or until onion is tender. In small bowl, mix onion and bacon. Set aside. Spray 8 jumbo muffin cups or 8 (6-oz) custard cups with cooking spray. Separate dough into 8 biscuits. Place 1 biscuit in each muffin cup, pressing dough three-fourths of the way up sides of cups. 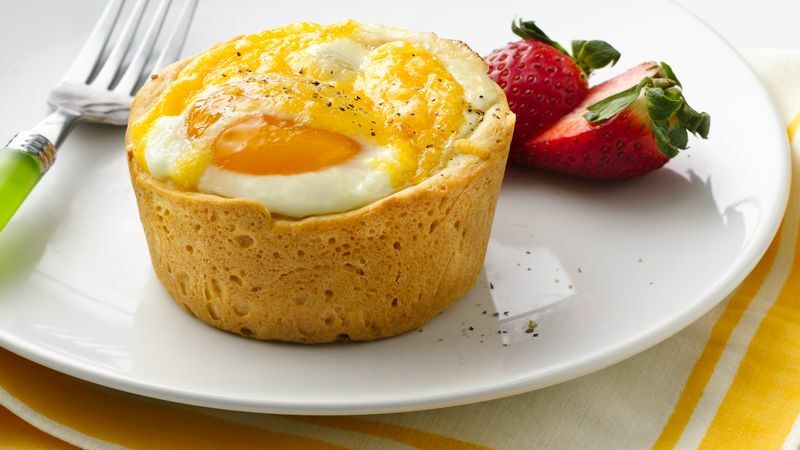 Divide bacon mixture evenly among biscuit cups; crack an egg over each. Top with cheese. Bake 30 to 35 minutes or until egg whites and yolks are firm, but not runny. Run small knife around cups to loosen. Serve immediately. Make a batch of these ahead. Cover and refrigerate. When ready to serve; reheat in 350°F oven about 5 minutes or until hot. Smoked Gouda can be used instead of smoked Cheddar, or if you prefer a cheese without the smoke flavor, substitute regular Cheddar, Gouda or Swiss.